1967 Dodge Monaco Station Wagon cont. Below will be some basic tips and ideas on car building. Also, there will be a few more advanced tips to build a strong, competitive car. Strip out all unneccessary things in the car. The more you take out, the easier all of the wiring and placing of batteries, tanks, and other things will be. It is a good idea to have a pry bar, hammer, drill with screwdriver bits, and a socket set handy. I try to get every screw, bolt, or clip that I can. You should have a can or bucket to put all of these in. Some people prefer to leave the bench seats in, but I take them out. It leaves more room for the shifter and batteries. I leave the windows until last. Leaving them in will protect whatever is inside from the weather if you cannot keep the car in a shop at all times during the building process. To take the windows out, use WD-40 and spray around all of the window seal. This breaks down the seal and makes taking the window out a whole lot easier. Use a piece of wire to break the window seal. Go completely around the window with it. The windows should come right out then. 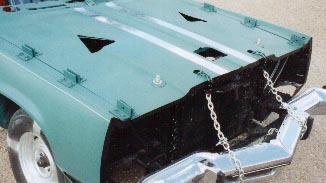 Doing a good job in preparing the hood is important in keeping your radiator and distributor safe. I like to use 4" pieces of angle iron bolted down on the hood and fenders to keep the hood secure. I then build two brackets on which I weld a 6-7" piece of 3/4" ready rod. This is then mounted along side the radiator on both sides. It runs up through the hood and is bolted down securely. I also chain from the front of the hood to the front bumper. This protects the radiator a little more and keeps the bumper from falling off. When all of this is done, the front becomes very strong. It also helps if the car has impact bumpers from 74-78 Chryslers or 74-76 GM's. If not, I suggest making the change to them. I also cut holes in the hood around the carb on both sides as well as above the radiator fill cap. Here are some pictures of how I build my front-ends. 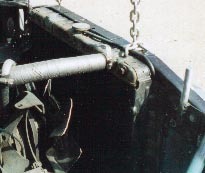 I used to weld my trunks down with 4" welds 4" gaps, but did not like how this worked. I then began bolting them down. This works a lot better and is much stronger than the welding is. I bolt the trunk down every 8", which is the rules around here. I also chain the trunk to the bumper. 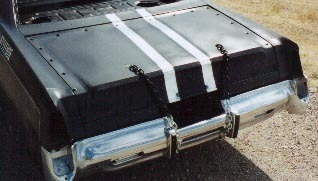 This holds the bumper on and keeps the trunk from coming up. Here are some examples of how I bolt and chain my trunks. Weld doors as much as is allowed. Chain them, also. Welds do break, especially on thin metal like what the doors are made of. I also use old grader blades to put over the driver's door. I have been driver's door hit by a 64 Imperial and this kept my door in very good shape. I have also begun using a screen on my front windshield area to protect my face from mud, rocks, or whatever tires can kick up. Here are some pictures of these ideas in use.